Best for: All Preperation time: 45 min. 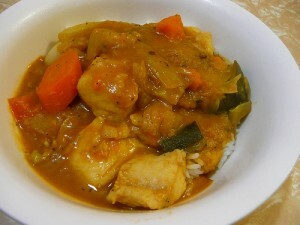 Fish Vegetable Deluxe recipe by Uzma Naeem at DesiRecipes.com. Add onoin, fenugreek seeds, cumin and whole red chilli. Fry till the onion is brown and then add kari patta. Fry for 1 min. Add tomatoes salt , chilli powder and ginger /garlic paste. Now fry this mixture well till the oil separates. Now add veggies and water. Put on low heat. In the mean time, cut the fillet into small fingers. Marinate the fish with black pepper and lemon juice. Wait for 10 min. Grease the pan and put it on high heat. Now add the fish and wait till it gets browned. (For 35 min). Remember fish dosen't take too long to cook. Now check your veggies if the beans and peas are done, fry for about 3 min. Before adding fish make sure there is no water. Now add fish with kalonji and fennel seeds. Put on low flame for abt 5 to 10 min. Your tasty fish vegetable deluxe is ready. Best if served with boiled rice or can be served with chapati.